Enclothed Cognition: How Your Clothes Affect Your Performance. The New York Times just released a very interesting article that explores the phenomenon we’ve all experienced. When you are dressed in attire that you feel good about, that you value, you actually improve your ability to perform. The idea of a lucky suit isn’t just a myth. 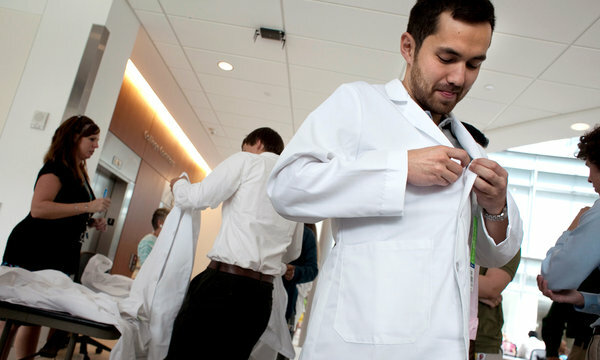 If you wear a white coat that you believe belongs to a doctor, your ability to pay attention increases sharply. But if you wear the same white coat believing it belongs to a painter, you will show no such improvement. You can apply this principal to your daily life. Need to close a big sale? Dress yourself for success in a suit that you know will get the job done. Looking for the right thing to wear to an interview? Select attire you would see a confident, capable professional in. Command more respect in the workplace by wearing clothes with intention and purpose. For all of the above, there is no greater confidence accelerator than custom clothing. When you wear a custom suit that is made for you, everyone notices. Especially you. Schedule an appiontment with a Professional Clothier. We’ll make sure you look and feel good in all of your professional ventures.